If you're a fellow American reading this, I hope you had a wonderful Independence Day. We celebrated all weekend long and had a blast! 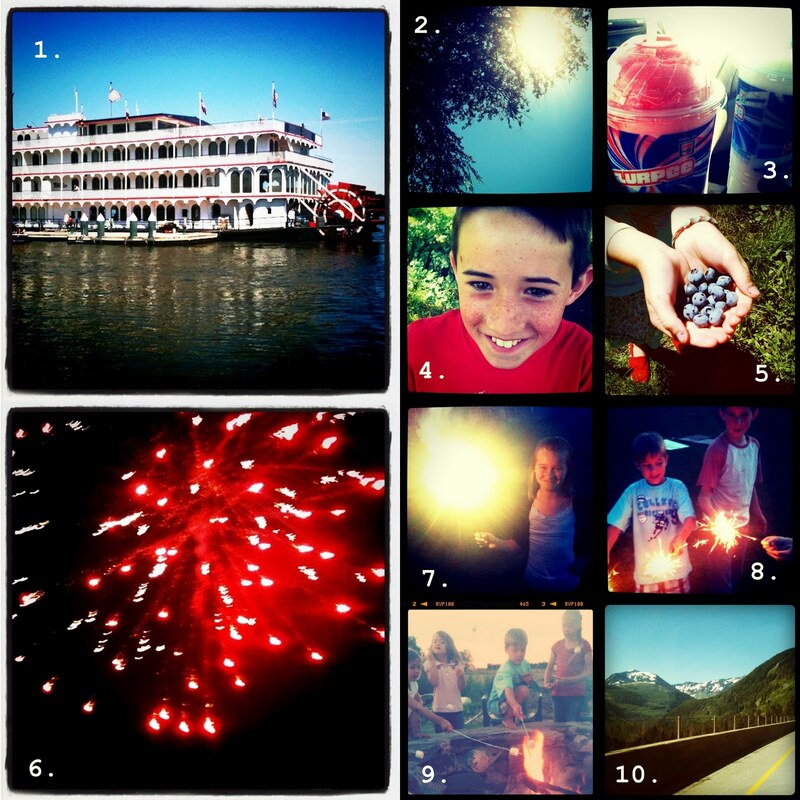 If you follow me on Twitter or Instagram [my username is marilynlott], then some of these photos might look familiar. 1. We started the weekend by taking our puppies to the park and were lucky enough to spot this gorgeous and patriotic vessel waiting for passengers. 2. The weather this past weekend was perfection. Warm, but not too warm. Just perfect. 3. We made a few stops for Slurpees. There's a 7-11 in a nearby town with 4 Slurpee machines, a total of 12 flavors. It's totally rad. 4. Thanks to the sun, a few new freckles have appeared. Keep em' coming! 5. We are in full fledged blueberry harvest and the U-Pick has been super busy. Have you visited yet? 6. The guys in our family are pyro-maniacs and put on a pretty impressive [sometimes scary + dangerous] fireworks display. 9. We fired up the pit and roasted S'mores with family and friends. 10. On Monday morning, I rose early to drive Jocelyn and her cousin across the state to attend EFY, a youth church camp. As I drove through the valleys and the mountain ranges, I felt a swell of gratitude in my heart to live in this blessed and beautiful country. God Bless America! I'm pretty sure posting will be light for a bit as we attend a family reunion this weekend, and then a camping/white water rafting retreat next week. Lots of fun ahead, and I'll be sure to post pictures when I return. P.S. I do have some music suggestions piling up that I will share eventually as well!